Spectra is a versatile device we use for addressing a variety of common skin care concerns. Also, this is the laser behind the popular Hollywood Peel – a minimally invasive procedure that leaves your skin with an overall radiant glow! This treatment has become a go-to for people who are getting ready for big events such as weddings & parties. What is the Hollywood Peel? What does it do? The Hollywood Peel is a laser procedure that’s grabbing international attention! The name comes from its popularity among celebrities who are preparing to walk the red carpet and have no time for downtime. The Hollywood Peel is a gentle rejuvenation treatment that improves texture & stimulates collagen – leaving skin soft, smooth and glowing. What is it like to get a Hollywood Peel? First, Spectra carbon lotion is applied to the skin and allowed to dry for a few minutes. Next, the treatment begins with the first pass of the laser, followed by a second & sometimes third pass. With each pass your skin is safely heated, breaking up pigment irregularities and stimulating new collagen. Simultaneously, a fine top layer of skin is ablated as the carbon lotion is removed, which is why it’s referred to as a “peel”. Furthermore, Hollywood Peels can be performed as often as every other week for maintenance or just once, depending on the results you are looking for. What is Spectra treatment like? Treatments are usually take about 10 to 15 minutes and are done in a series of sessions spaced 4 to 6 weeks apart. With this in mind, the exact number of sessions you’ll need is hard to predict & ultimately depends on the progress from one treatment to the next. Generally speaking, this treatment is very easily tolerated and numbing isn’t usually necessary. 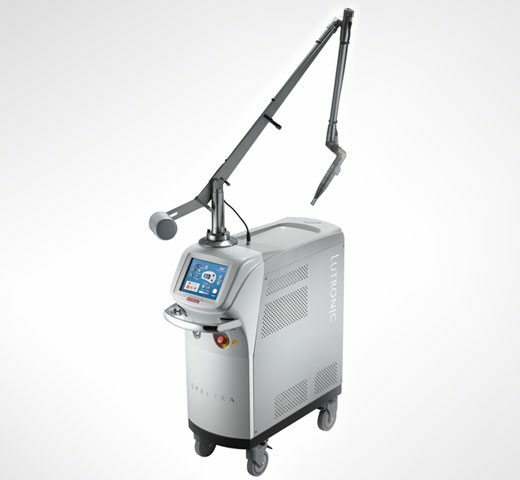 As an illustration, when treating melasma, brown spots & tattoo ink, you may feel a warming sensation as the laser energy penetrates the skin to break up the pigment or ink. What are the side effects of Spectra? Any downtime? When performed by an expert in laser procedures, the side effects with Spectra are limited. Although rare, slight pigment changes of the treated skin are potential side effects due to this procedure. In the event that lightening or darkening of the skin occurs, it can be treated. Lastly, there’s little to no downtime so you’ll be able to return to your normal activities immediately following treatment. When will I see results from Spectra? Spectra works for all skin types because it treats conditions gently & gradually, which limits the risk for common laser side effects. For this reason, it’s impossible to predict how quickly you’ll have results. However, improvements build steadily after each & every treatment session. Without a doubt, the key to lasting results is proper post-treatment care. For example, diligent sun protection is key in order to maintain good results due to melasma treatment. At the same time, keeping acne and brown spots under control is dependent upon maintaining your recommended daily skin care routine.